" New York Style" Right Here in New Orleans! 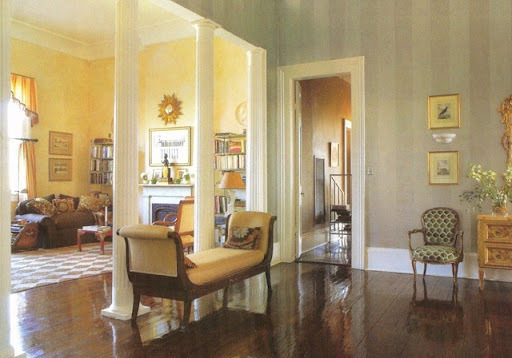 A recent article in Louisiana Homes and Gardens featuring the apartment of Ned Marshall is entitled "New York Style." I guess this is because Mr. Marshall came to New Orleans from there. But I think this apartment shows more than enough evidence that Mr. Marshall clearly has his own very personal style-a style which is simultaneously graceful, elegant , fun and chic. And this, in fact is a style which is often regarded as "New Orleans Style." Marshall moved into this apartment, which is has a first floor entry, shown above, that leads to a grand and spacious home on the second floor of a Garden District Mansion. This entry sets the tone for all the delights which are to come. 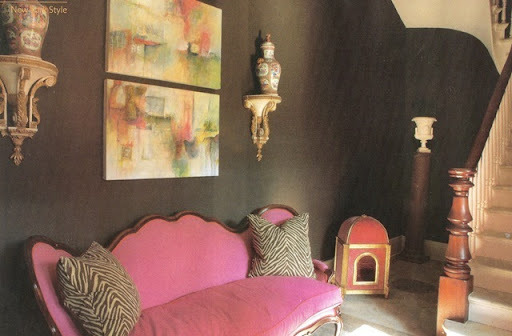 The chocolate brown walls are a dramatic backdrop for the magenta-upholstered french sofa, the pair of abstract paintings by New Orleans' own Katie Rafferty, gilded brackets which hold 19th century Chinese vases, and last, but not least, a gilt wood and silk velvet niche de chien, or dog house-a copy of a 19th century original that can be seen at the Metropolitan Museum in New York. Other evidence of Marshall's sense of style are the gilt mirror over an antique iron demilune and the chocolate and tan zebra striped throw pillows. Icing this already rich cake is the hand-painted faux marbre floor which Marshall executed himself. 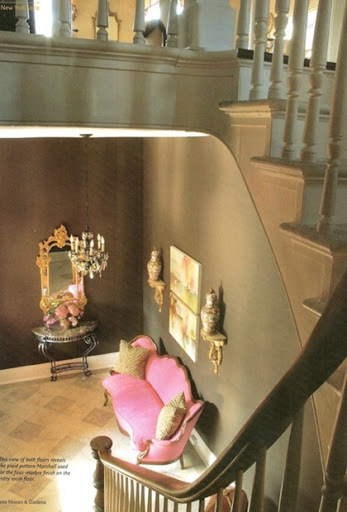 It's no surprise that a stairway as grand as the one above could only lead to an equally fabulous landing. Marshall seems to be quite the collector and he's not shy about displaying his remarkable finds. Another paint treatment by the decorator- the walls are painted with two shades of silver stripes. This dramatic dining room makes me want to party! 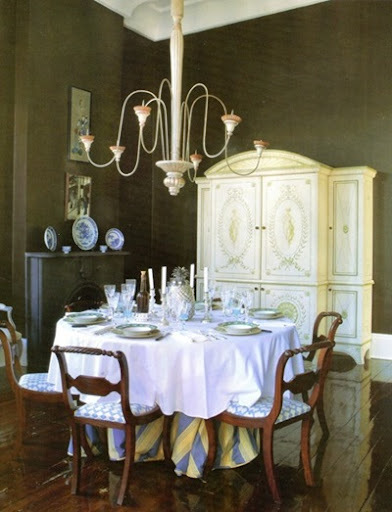 The draped table with the pristine white tablecloth, the chandelier in creamy tones and the handpainted armoire really stand out in exuberant contrast to the dark walls. I love his use of blue and white, as seen on the porcelains on the mantle and on the chair seats. I find this elegant table setting more than inviting. 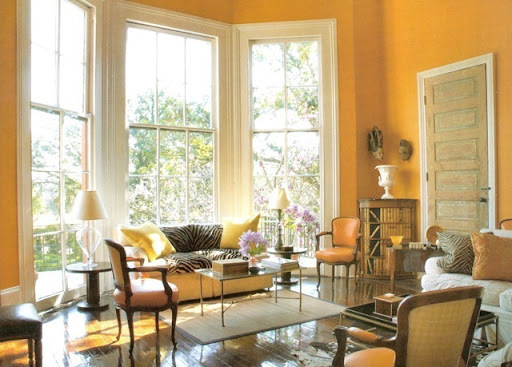 This view of the parlor, which is also pictured at opening of this post shows walls which Marshall calls "Hermes-box orange." 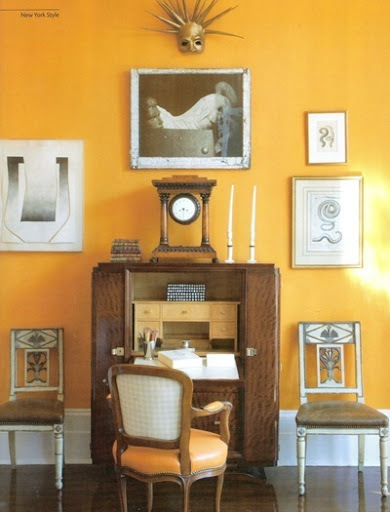 He was inspired to use this color by the leather on the French chairs in this room. This photo shows Marshall's style in its finest-he uses color for dramatic effect, he employs balance and symmetry in his furniture placement and he carefully displays his collection of objets and art with both exuberance and restraint. Another chocolate brown room on the second floor is a study in contrasts with all white upholstered French pieces. More fabulous pieces of note: the Chinese reverse glass paintings, an 18th century French bracket clock and a Maison Jansen coffee table. 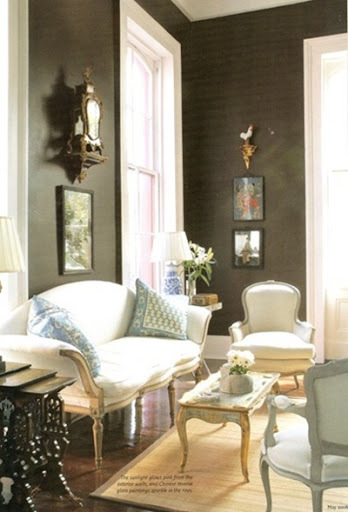 I love that coffee table surrounded by the graceful French seating. 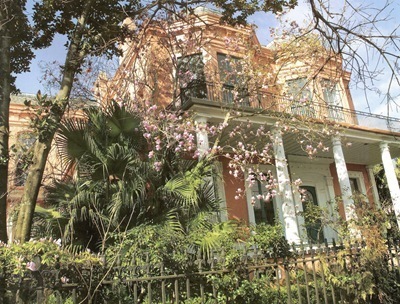 This exterior view of the 160 year old home of which this apartment is a part shows the typical New Orleans overgrowth of lush tropical plants, all enclosed by an ages-old iron fence- all of which embody the redolent gorgeousness of the city that we are lucky enough for the talented Ned Marshall to call home.